Aoibhin Garrihy has spoken about motherhood, revealing that while she has not experienced the baby blues with her first child Hanorah, being a new parent can be tough. "There are days when of course it's a struggle, and that's just part of it," she said. "I think you take the good with the bad and it's all worth it in the end. "You can't but count the blessings when you have a gorgeous baby to show for it. "I've heard stories of people who are trying to have children or, you know, things don't go to plan, and you really have to try and remind yourself that you are blessed to have this little bundle of joy. "And anything worthwhile is not easy, is it?" 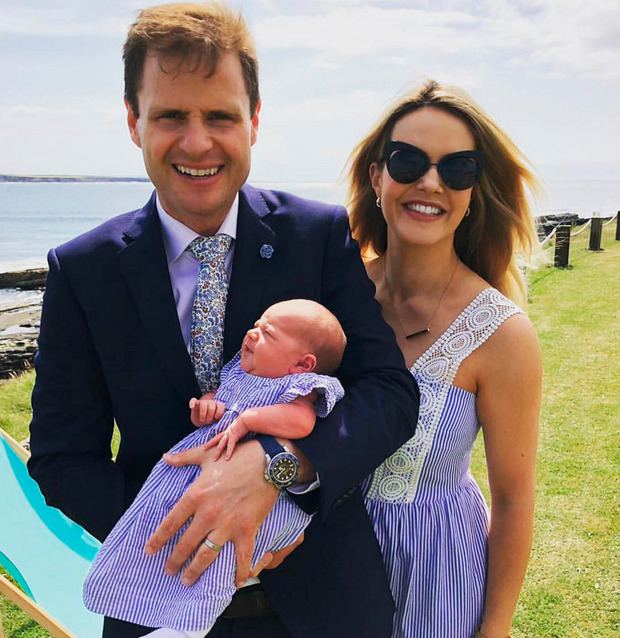 Former Fair City actress Aoibhin welcomed her first child with hotelier husband John Burke in June and has admitted that it is all hands on deck to help out with the baby. Aoibhin hasn't taken on too many jobs since giving birth, but counts her lucky stars for having close family members on hand to mind Hanorah when she does. The actress, who is originally from Castleknock and currently lives in Co Clare, has admitted that the old adage "it takes a village to raise a child" rings true. "It's not nine to five. I've been able to do the odd gig here and there and I've definitely slowed it down," she said. "It's a cliche, but it does take a village, so for those days she goes to nana or the other nana. "I'm very lucky to have my family around and John's family around, and they're only crying out to take her." However, while adapting to parenthood has had its challenges, overall it has been a positive change for the couple. "It's going great," Aoibhin told Woman's Way magazine. "It's probably the most full-on project, if you could call it a project. "People say, 'Oh, as soon as she arrives, your whole lives will turn upside down', and they haven't been, she's been amazing." Aoibhin credited the fresh country air of Co Clare and the recent good weather for helping her keep a clear head as a new mother. "If it was the depths of winter now, I could imagine just rolling under the duvet with her and just having those mummy/baby snuggles, but we got out and the weather was just so fab," she said. "When we have this gorgeous scenery on our doorstep in Co Clare, it was hard not to enjoy it. "It really helped me in the sense that it was good for my head, and they talk about baby blues and the rest, but I didn't get that." The couple christened Hanorah on Saturday in Clare, with Aoibhin's sister Ailbhe standing as god- mother.